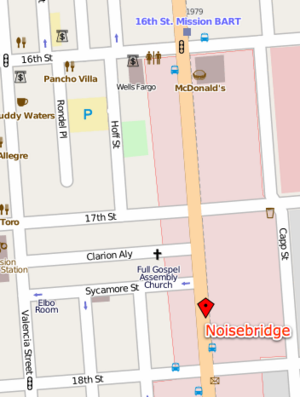 Noisebridge is located on the 3rd floor of 2169 Mission Street, San Francisco, CA 94110-1219, between 17th and 18th street (37.76717 N, 122.418423 W), 1.5 blocks south of 16th Street Mission BART station. Press the Noisebridge "doorbell" to the right of the gate, and someone will buzz you into the space. An elevator with manually-operated doors is available, and here is some basic accessibility information. Here is a Map of the inside of Noisebridge. If this is your first time here, please review our visitor advice. We have more information here on getting in using really space-age or really old-fashioned ways of opening doors. You can also find directions to our old space. 511.org is great to help plan your Bay Area travel. San Francisco International Airport (SFO) is about 30 minutes away. Oakland International Airport (OAK) is about 50 minutes away. Caltrain, Capitol Corridor Muni and BART transit systems can help get you around the Bay area on public transit. BART (Bay Area Rapid Transit) train service runs 4:30am-midnight weekdays, 6am-midnight on Saturday, and 8am-midnight on Sunday. The train schedules are generally accurate to within about 3 minutes. Walk 1.5 blocks south on Mission Street. 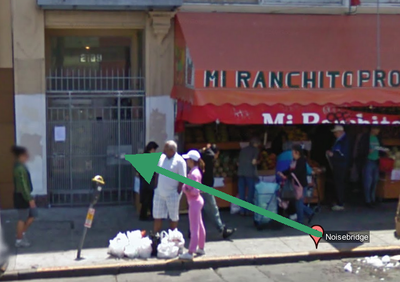 Noisebridge is on the left, 2169 Mission, just before Mi Ranchito Produce Market. Caltrain service runs from 4:30am-midnight on weekdays, 7am-midnight on Saturday, and 8am-9pm on Sunday. The train schedules are generally accurate to within 10 minutes, but can often be delayed for significantly longer. Your best bet if a train doesn’t show up is to search "caltrain" on Twitter. Wait to board the next train. As of writing, all BART trains serving Millbrae also travel to 16th Street Mission. From here, see the BART directions above. You can also take Caltrain to the 22nd Street or 4th and King Stations, but it will usually be faster to just take BART. Connecting bus service to Fremont is available on Route 801. AC Transit's schedule doesn't indicate whether routes 800 and 822 will stop in front of Noisebridge at 18th Street. If you know whether or not they do, please edit this article and say so. See the San Francisco Bike Coalition bike map for bike directions to Noisebridge. Noisebridge can be found in the center-right portion of this map. Find us on Google Maps or OpenStreetMap. Evening street parking in the area is difficult since the 16th and Valencia area is a popular entertainment district. Most street parking in the area is metered 9am-6pm. There is a commercial parking garage at 42 Hoff Street, about two blocks from Noisebridge. Several BART stations outside of San Francisco city limits also have parking available. San Francisco is famous for car break-ins; you should place all your valuables in the trunk of your car. 1.5 miles after the Bay Bridge, exit right at "Golden Gate Bridge | North 101 | Exit 1B"
in 0.5 miles exit right at a double sign that reads "Duboce Ave | Exit 434A" and "101 North | G G Br | Mission St"
Go 1.6 miles (approx 16 blocks) and find yourself in front of Noisebridge! Starting at Noisebridge, go 1/2 block north to 17th St.
Take your first right onto Hoff St.
Like some other big cities, you can sometimes get lucky and find unmetered parking if you drive around the side-streets. This page was last edited on 21 March 2017, at 21:12.